Prague is a city that until I visited it, I really did not know much about. In fact, as a history student I am pretty ashamed to admit that my knowledge of the Czech Republic in general is exceptionally limited. So when I was procrastinating starting my dissertation proposal and on a whim booked an apartment there with two of my friends for a few days I really did not know what to expect. But what I was greeted with as I stepped of the bus is a beautiful city steeped in history which is slowly cementing it's identity after an incredibly rich and turbulent past. 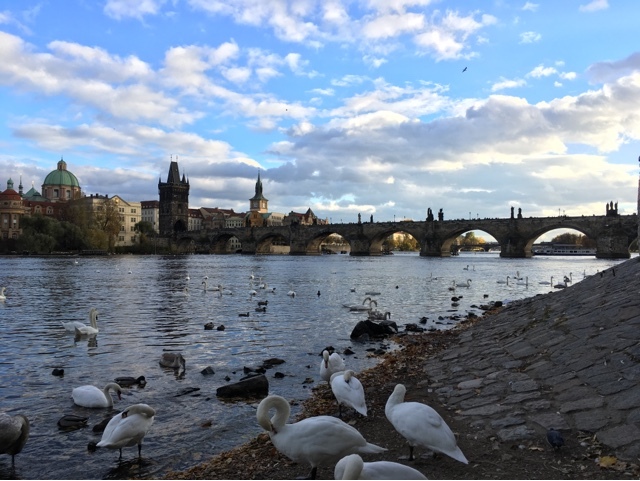 The historic centre of Prague having been designated a UNESCO world heritage site in 1992 and it is easy to see why. But rather than blabber on and on about all the things we got up to I thought I would try a slightly different format and focus on five photos which give a nice overview of what we got up to whilst we were there but also really try and encapsulate some of the beauty of the city. This first photo shows the Tyn Church, which overlooks the old town square. Dating all the way back to the 12th century, the old town square features so many beautiful buildings although a very touristic atmosphere. One of the best things to note about the square are the various free walking tours of the city which depart there throughout the day. Yes you read that right, free tours! Walking for three hours around the city learning all about the history and the current day situation from someone who experiences it on a daily basis is almost invaluable as a tourist. Of course the catch is that at the end of these free tours you are encouraged to tip your guide however much you think your tour is worth but I would still definitely recommend making a city tour one of your first ports of call. If nothing else it is an excellent way to orientate yourself. We went with Sandemans, however there are many different ones available. 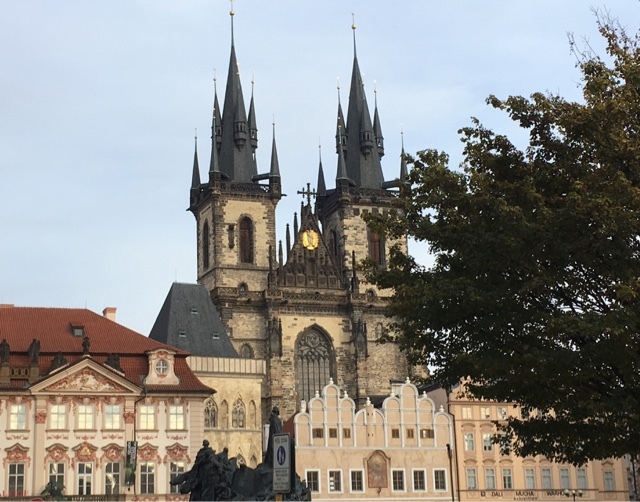 Interestingly, according to our tour guide the Old Town Square also features the second-most disappointing event in the world on a daily basis - the hourly chiming of the Astronomical Clock, which I can safely vouch was exceptionally underwhelming. After seeing the hourly shows in both Munich and Nuremberg this one didn't even come close. Our tour guide told us how the astronomical clock actually worked and told the time which was significantly more interesting than the show. Next we move on to Charles Bridge, one of the most infamous monuments in Prague. Construction began in the 12th century. Despite providing an obvious function the bridge is also home to many musicians and artists creating a wonderful atmosphere which aids the already incredible views. Just like to give a quick shout out to the swans who made taking this photograph terrifying. They were EVERYWHERE! 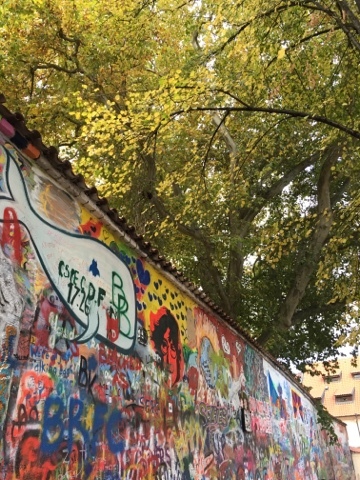 One of Prague's tourist attractions, although slightly less conventional is the John Lennon Wall. On the same side of the river as the castle it features layers upon layers of graffiti, most of which calling for peace in humanity. It's a really interesting thing to have a look at and as it obviously changes every day as new graffiti is added you can pop along at any time. Another thing worth mentioning not far from the wall is the Kafka Museum. Now if you have prior knowledge of Kafka and his viewpoints then I would definitely recommend a visit. It will leave you confused, upset, baffled, disparaging and questioning the meaning of life, but if you are a student or know his works then it really helps give an insight into his private life and childhood. If on the other hand you have no idea what I'm talking about, save yourself the headache and don't bother. Most of the information was available in Czech and English however many of the quotes and extra pieces of information are in German. 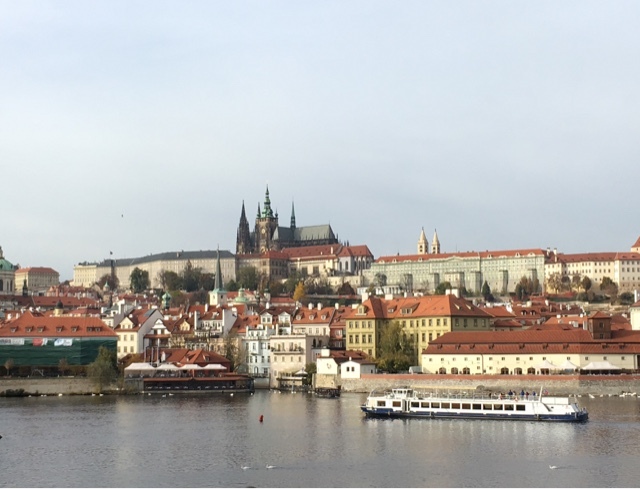 In the above photo you can see the incredible complex of Prague Castle. Taken from the other side of the river which is perhaps the best place to look at the castle as you get to see it standing in all it's glory. I would definitely recommend hopping across the river, you can either walk across any of the bridges or take the tram (don't forget to buy your ticket and validate it!!). I really want to go back to Prague and spend a bit more time around the castle area. The photo below captures what I think was my favourite moment of the trip. 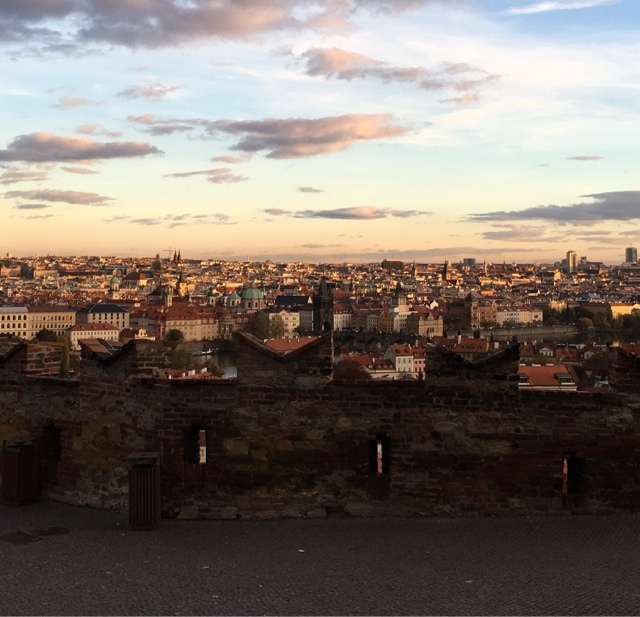 After going on an infamous Prague Pub Crawl the night before let's just say we didn't make it to Prague Castle as early as planned. 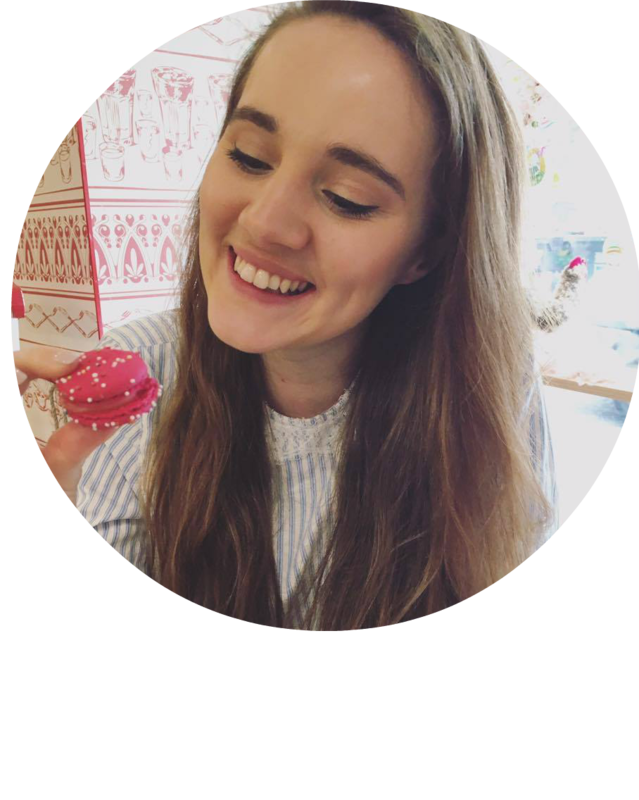 I will link the company we went with just in case any of you are interested here, as I would definitely recommend doing a pub crawl or something similar if you are travelling alone or in a really small group! We met so many really interesting and lovely people and there was such a friendly atmosphere! This however turned out to be a blessing in disguise as we got to watch the sun set over the whole city. As the castle is on the other side of the river to the main centre it gives you such a beautiful view. It's moments like that one where I just sit and can't quite believe what's happening. Two months ago I was still in Scotland working full time and dreaming of doing something different and adventurous and now there I was, sitting watching the most beautiful sunset in a country so far away from home with people I am just still getting to know. I've never visited Prague but would honestly love to! Your images capture it, exactly the way I imagined it to look!